Over 15 years experience providing festival bars to small and medium sized festivals. As a small family run company, the company directors have a close working relationship with all our event partners allowing us to deliver bars with true care and attention. 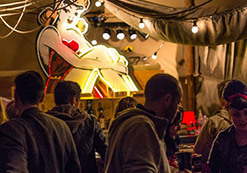 We have been working in the festival industry since the late 1990s in the festival bar business since 2002. During that time have run a wide variety of successful bars at all sorts of events as well as building up complementary event skills including festival venue design, event production, licensing, brand activation and staff provision. 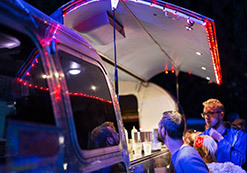 We have all the in-house creative teams, crew and bar staff to create coordinated bar offerings that work for your festival, the event site and the customers. We started running festival bars in 2002 at The Big Chill. Jam Events, which Jess was a founding member and director, ran all the bars at the Big Chill from then until 2007, building up to a festival of 35,000 people. 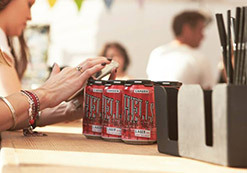 The Big Chill became a game-changer in terms of food and drink at festivals. Organisers and customers alike started setting their standards much higher than had previously been the case at festivals or large outdoor events. The ravers and free party people of the early 90s had grown up, got jobs, young families and wanted a new kind of high-end festival experience. Why shouldn't they be served perfect cocktails while dancing in the sunshine to Greg Wilson or Norman Jay? Of course the lager should be perfectly chilled throughout the weekend and there really isn't any excuse to run out of fresh lime or tonic. These are the principles on which we learned our trade, hand in hand with a Leave No Trace ethos of looking after the beautiful spaces we are privileged enough to party in. 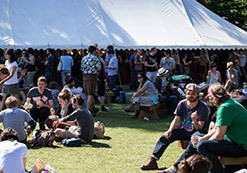 Between 2007 and 2009 Jam Events went on to run all the bars at The Green Man Festival in Wales, which saw a big swing to ale drinking and we started locally sourcing breweries and traditional cider makers. In 2010 we set up The Really Good Bar Company and now work on multiple events throughout the year. We are based in Brighton and the Isle of Wight but cover events across the UK.